This is a tribute to our beloved ColecoVision. An classic 8 bit region free video game console. Do you have any ColecoVision news. Around 500 visitors every single month. Screen: Wide, Resolution best In 1440 x 900 or higher. Textsize: 100%. Not optimized for: MS Explorer, iPads, and Cell Phones. ColecoVision.dk supports the former toy giant from the 80's, Coleco Industries Inc. as a private fansite. 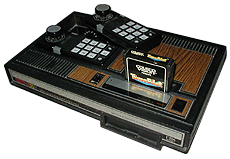 The original Coleco name and ColecoVision name refers to the former 80's Toy giant, Coleco Industries. CBS belongs to Colombia Broadcasting System, Not the newer Copenhagen Business School (CBS). The "newer" names "Coleco" and "ColecoVision" in Eurostile font belongs now to Dormitus Brands. You can use the pictures and links if you specify the source, just do not violate the trademarks. Thank you to all respective owners for Fair use of pictures and brands with your kind permission. ColecoVision.dk is aware of use of accessible and public photos on the Internet worldwide. This also applies to images used here at ColecoVision.dk and Nesmaster.dk that is believed used unauthorized. ColecoVision.dk trying as far as is possible to obtain rights for use of images and trademarks. Colecovision.dk is trying to unite people and work with the community on different sides. This ColecoVision fansite is about the former ColecoVision video game console and its related. But also the good old ADAM Family Computer System. You can safely contact ColecoVision.dk with everything that is relevant, tests, Images, reviews, gifts, homebrews, etc. ColecoVision.dk is a friendly site, built with retro respect, and for Fair Use. generally specific only to the particular product market and geographic area of the trademark owner." Denmark 1996-2019 Ten-Four Service Production.